This post is the first in the Fall-Fun Series and linked with It’s Playtime. It’s been a while since I posted any craft-related things on Schooling a Monkey. I’ve been busy with work and trying to keep up with Bo. We’re lucky if we get the dishes done most days. But, fall is my favorite time of year, and I have tried several Thanksgiving or fall-themed crafts that I never have shared with you. So, in November and the rest of October, I’ll share some fall and Thanksgiving-related projects that you can do in your own celebrations! 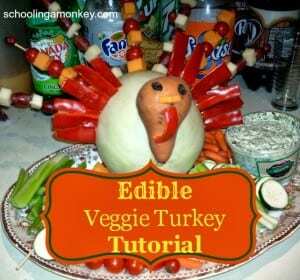 Today, we have the veggie turkey. I think I got the inspiration for this turkey out of a magazine. Probably FamilyFun magazine. 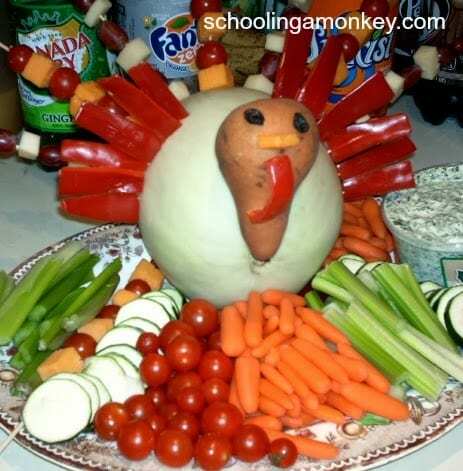 Here’s a close-up of our veggie turkey. Step 1: Cut a slice off of the bottom of the melon so that it will lie flat on the tray. Place the melon in the center of the tray. Step 2: Use a bamboo skewer to attach the pear to the front of the melon like a head. You may need two. This was the most unstable part of our turkey. Step 3: Cut the cheese into edible-sized cubes. Alternate cheese with grapes on the skewers. We used 7 skewers to make our turkey’s tail. Push the ends of the skewers into the melon to make the tail. Step 4: Cut the bell pepper into strips. Spear the end of the peppers with a toothpick. This is kind of tricky, because the bell pepper is thin, but it can be done. Stick the bell pepper strips into the melon to make wings. We used 6 strips per wing. Step 5: Use toothpicks to attach raisins to the pear for eyes and a triangle of cheese for the beak. We attached a strip of red bell pepper for a waddle. 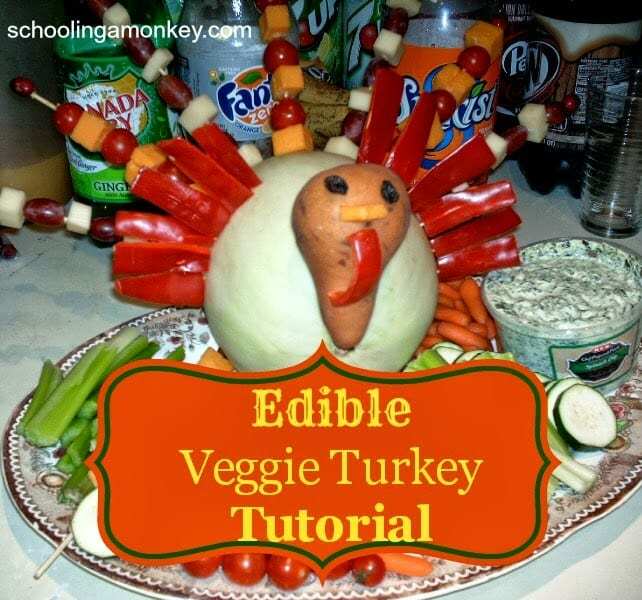 Step 6: Cut up assorted veggies to place around the bottom of the turkey. You can also cut out feet shapes from bell pepper, but our veggies covered up his foot area anyway, so we skipped feet. Place the dip on the tray and you’re good to go! Children will love making this project and eating it as well. You can experiment with the kinds of vegetables or use all fruit. Imagination is what makes this edible craft fun. Did you make this craft? Share your experiences below!